There are superhero stories, where a person has Great Powers and has to Save the World or Something Else Important. And everything, for the most part, is Good and Evil and Right and Wrong. And then there’s Teen Boat. His superpower? Turning into a small yacht. His life? Is pretty much the life of your ordinary, average high school boy: he’s crushing on the cute girl, his best friend thinks he’s clueless, he get detention, he has to get a job. Nothing Superheroish here. It also doesn’t help that he turns into a boat at the most inopportune times. (Internal inconsistency alert: can he turn into a boat at will? Well, sometimes. And sometimes he can’t. But he also can turn into a boat against his will when water touches his internal nautical activation button, which happens when he gets water in his ear. It doesn’t really make sense.) What his life is, really is a balancing act between his abilities and his desires. With random pirates. The best word for this book? Silly. Ridiculous. In the best possible way. 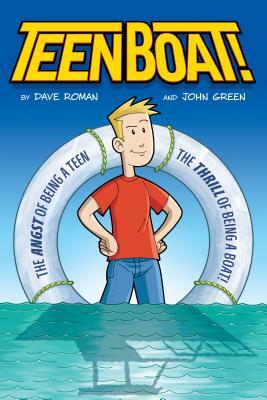 Teen Boat (or TB for short) (that’s really his name) is a fun character, very much the awkward teen boy, put in absolutely insane situations. (I was serious about the pirates.) I do have to admit that it wore on me after a while; by the end I was rolling my eyes more than laughing. But even with that, it was still a fun — well, silly — read. Sounds like a fun book to introduce to reluctant readers. Whenever I read the description for this one, I think it probably is not for me. But then all the reviews I've read have been positive so perhaps I don't know what I'm talking about. Glad to hear you liked this. I'm always ready for a silly graphic novel to mix things up.